Construction industry in the Baikal basin is one of the growth points of its economy and ecological well-being. One of the main indicators of the construction industry is the square meterage of the built civil and industrial facilities. Generally, it reflects its social and economic status in some regions. A current characterization of a segment of the construction sector – the residential construction – is conducted based on the observation of governmental statistical data [Districts…, 2013; Construction in Zabaikalsky krai, 2013; Construction in Russia, 2012; Construction and commissioning…, 2013] and the Internet resources [Federal State Statistics Service]. In the past three years (2010 to 2012), construction put-in-place increased three-fold (from 0.4 to 1.2 million sq. m). Judging by the growth of the absolute values of the residential construction put-in-place, Irkutsk oblast – the most urbanized region in the basin – tops the list with over a half of the volume of commissioned residential housing in the Baikal basin (2012). The Republic of Buryatia is the second (26.2 %), and Zabaikalsky krai is the third (19.3 %). The most important characteristics of residential development is the annual square meterage of the built housing (m²/person), which is presented as a background indicator of the map. By absolute indicators, Russia reached the pre-reform level of residential development in 2007. However, the specific indicator of the floor space of commissioned housing both in the country in general and in the Baikal basin in particular does not exceed 0.5 m²/person (in developed countries the annual construction capacity is at least 1 m² per capita, while the annual growth of housing put-in-place is 4.5-5.0 %) [Federal State Statistics Service]. Territorial differentiation of municipalities of the region according to this important indicator is quite contrasting. High specific indicators and the stable growth dynamics as a result of the implementation of targeted state programs facilitating residential development are observed across the whole territory except for the Republic of Tuva. Irkutsk oblast is leading, with its indicators being twice as high as the indicators of other regions (0.81 m²/person against the average regional indicator of 0.45 m²/person). 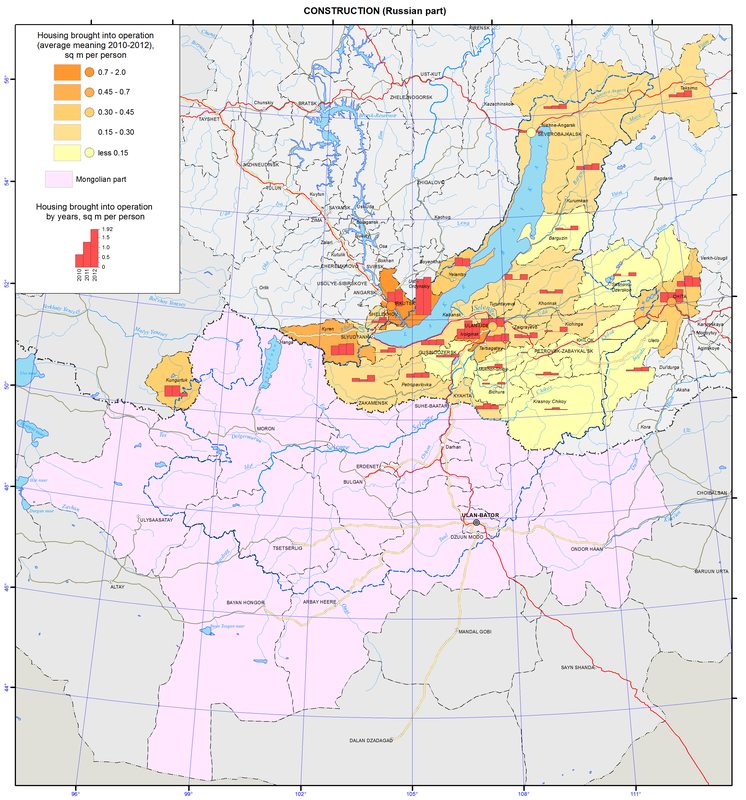 − The current focal points of growth – Irkutsk and the Ivolginsky district (Republic of Buryatia). The most important instruments for improving residential development are targeted state programs of regional and municipal levels. These programs focus on the implementation of comprehensive measures for the development of large-scale residential construction in the region. The key “driver” of the so-needed residential development in the municipalities of the lower level is the social and economic planning using various regional programs. Statistical Compendium. (2013). Districts of the Republic of Buryatia. Ulan-Ude: Buryatstat. p 102. Statistical Compendium. (2013). Construction in Zabaikalsky krai. Chita: Zabaikalkraistat. p 47. Statistical Compendium. (2012). Construction in Russia. Moscow: Rosstat. p 220. Statistical Compendium. (2013). Construction and commissioning of facilities in Irkutsk oblast. Irkutsk: Irkutskstat. p 36.